Chapter 30 - Pentecost Pt 3 - Will You Restore the Kingdom? Summary: A closer look at the festival of Pentecost itself. This chapter also discusses what this harvest festival (also known as the Feast of Weeks) has to do with the great outpouring of the Holy Spirit in Acts 2. This is the second study of four pertaining to the events of Pentecost described in Acts chapter 2, an event at which there was a great outpouring of the Holy Spirit. In the last study, we began by reading portions of Acts 1 & 2, noting the promise and fulfilment that the Holy Spirit would come upon the apostles on the day of Pentecost soon after the Lord’s ascension. I made the point that to understand what took place on that day of Pentecost, we would need to understand something of the annual feasts or festivals of the Jewish calendar. 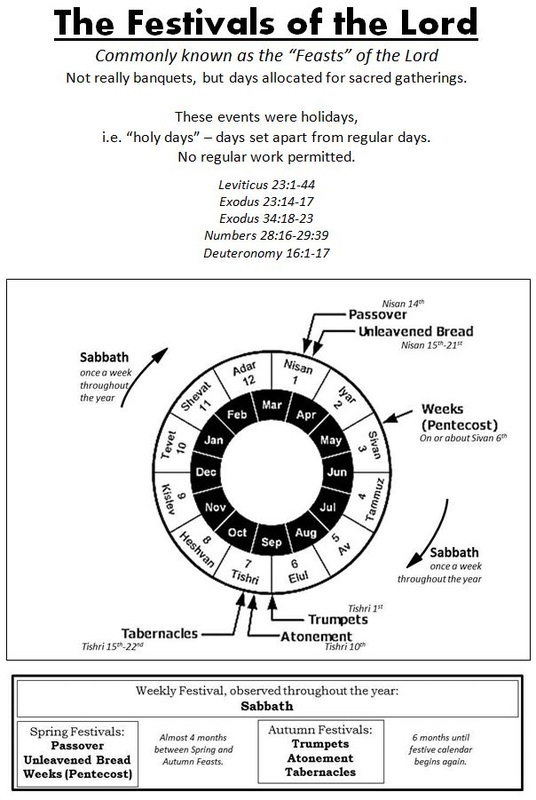 So we spent most of last week looking at Leviticus 23, and getting an overview of these festivals, including Pentecost, or the Feast of Weeks. In this study, we’ll focus a bit more on the festival of Pentecost itself, and try to see how it fits in with the outpouring of the Holy Spirit in Acts 2. Please refer to the “Festivals” chart during this study. We won’t be able to cover every aspect of this festival in one session, but I think we’ll cover enough to show the link between the festival of Pentecost and the outpouring of the Spirit. We’ll start by reading the different accounts of Pentecost, to get a feel for the three feasts to be attended, and the emphasis on the harvest and ingathering nature of the latter two of these. Even though we are focusing mainly on Pentecost, these festivals were not really meant to be considered in isolation. Last week we focussed on Leviticus 23, but these festivals are mentioned in other passages as well, so let’s read some of those occurrences to get a feel for what Pentecost was about. v.16 – called the Festival of Harvest here. Tabernacles is called the Feast of Ingathering. - Note the emphasis on harvest in these verses. - compulsory attendance for males for three of the festivals. 23:17 You shall bring from your dwellings two wave loaves of two-tenths of an ephah (a bit under 4 kgs of flour). They shall be of fine flour; they shall be baked with leaven. They are the firstfruits to the Lord. The offering of these types of loaves is distinct to Pentecost. Leaven - this is one of the few levitical offerings with leaven. Leaven is usually associated with sin, or that which pervades. Almost every bread or grain offering in the law had no leaven – generally an indication of Christ’s sinlessness. Here it represents people somehow. 23:20 The priest shall wave them (the sin- and peace-offerings in v.19) with the bread of the firstfruits as a wave offering before the Lord, with the two lambs. They shall be holy to the Lord for the priest. Loaves and the two lambs waved - why waved? Leviticus 23:22 – a seemingly random law about harvesting. Pentecost was related to the harvest. The offerings made were firstfruits, not the entire harvest. Note that there were other laws about the Festival of Pentecost, mentioned in Numbers 28:26-31 & Deuteronomy 16:9-12.
v.40 - no “firstfruits” offered in Tabernacles, just the produce. What have these harvest festivals got to do with the outpouring of the Spirit in Acts 2? To answer that, let’s look at things from a different angle now for a few minutes, and read some passages which speak about an outpouring of the Holy Spirit. Eventually we'll tie a few of these ideas together. READ Numbers 11:16,17...24-29 , the desire for the Spirit to be on all God’s people, not just a few here and there. Up until Acts 2, the Spirit came upon just a few people now and then to help carry out God’s dealings. Acts 2 commences a time when all those who put their faith in God’s Messiah would receive the gift of the Holy Spirit (as we’ll see shortly in Acts 2). These are pictures of the Festival of Tabernacles (still future), but as we’ll see, Pentecost at Acts 2 (past) was a foretaste of the full harvest of Tabernacles yet to come. READ Ezekiel 36:24-28 here again, really more akin to the Festival of Tabernacles, but Pentecost is a foretaste of this event. Matthew 9:35 -10:1,5-8 - harvest references. - A picture of what was to take place in the Acts Period, as the Lord endows the disciples with the Spirit. Revelation 14:14-16 Then I looked, and behold, a white cloud, and on the cloud sat One like the Son of Man, having on His head a golden crown, and in His hand a sharp sickle. And another angel came out of the temple, crying with a loud voice to Him who sat on the cloud, “Thrust in Your sickle and reap, for the time has come for You to reap, for the harvest of the earth is ripe.” So He who sat on the cloud thrust in His sickle on the earth, and the earth was reaped. Pentecost in Acts 2 and "firstfruits"
v.47b – more added daily – but still not the whole nation, not the whole harvest. Two passages which speak of such believers during Acts as being firstfruits…. The festival of Pentecost / Weeks was one of two harvest festivals in Israel’s festive year. At Pentecost, the firstfruits of the harvest were offered. At Tabernacles, a greater amount of produce was offered, and these were not necessarily the firstfruits. The events on the day of Pentecost in Acts 2 describe the firstfruits of the harvest of a regenerated Israel. In the future, when the Lord establishes His kingdom on earth, His people Israel will be blessed with an outpouring of the Holy Spirit. That future event is likened in prophecy to a harvest, when Israel are gathered in to be His people. That will be a fulfilment of the later harvest festival, the feast of tabernacles, also known as the feast of ingathering. The day of Pentecost in Acts 2 symbolises the firstfruits of the harvest - not the total yield of the harvest, but a foretaste of that greater harvest which is still yet to come when the Lord returns. In Acts 2, those first 3000 Israelites to come to a belief in the Lord Jesus Christ and be blessed with the Holy Spirit prefigured what will happen when His kingdom comes to the earth. The Spirit will be poured out upon the people in an overt display of God’s ownership of that kingdom and of those people. In the next study, we'll look a bit more at Acts 1 and 2.